It’s the sort of machine that I’d expect to find and read about over at the Dante’s Wardrobe blog, but yet it has proved to be something of a complete mystery. Let me introduce you to a typewriter that I have not seen an awful lot of information about. Filthy, filthy keys. And these had already been scrubbed once. A few months ago a member in the Portable Typewriter Forum on Yahoo! mentioned that they had a ‘Pharmaceutical typewriter’ that they were willing to part with. Being that this was very closely related to my line of work, I quickly messaged the member and expressed an interest in this machine – that is if the person he’d originally offered it too turned it down. It was an interesting Royal portable with a brown paint scheme, which before I knew it was shipped off to Singapore. 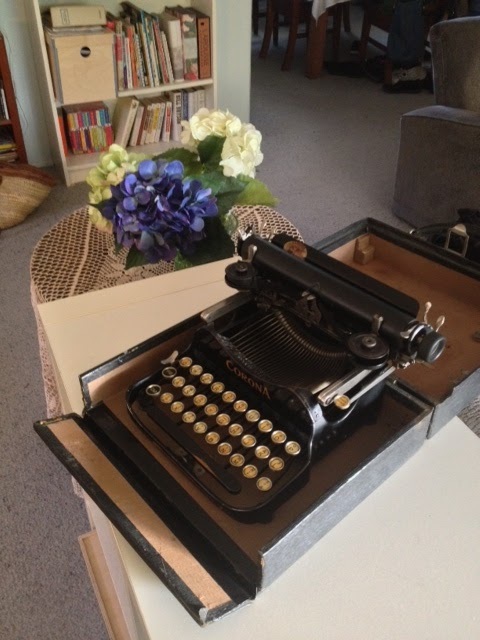 “Oh well”, I sighed in an email back to the charming typewriter enthusiast; Robert Neuwirth, (who is a journalist and excellent writer) And that was that – or so I thought. Robert goes by the name of Squattercity on the Yahoo! Forum. This name comes from Roberts blog (as linked above), and an excellent book that Robert wrote called Shadow Cities: A Billion Squatters, a New Urban World. A book that I will be posting a review of on here sometime in the near future. Some weeks later an email notification flashed up onto the screen of my iPhone. It was Robert, and he had come across an interesting Corona 3 on ebay that he through might be right up my ally. He was right. After I clicked into the link, I have to say I couldn’t have been more excited. 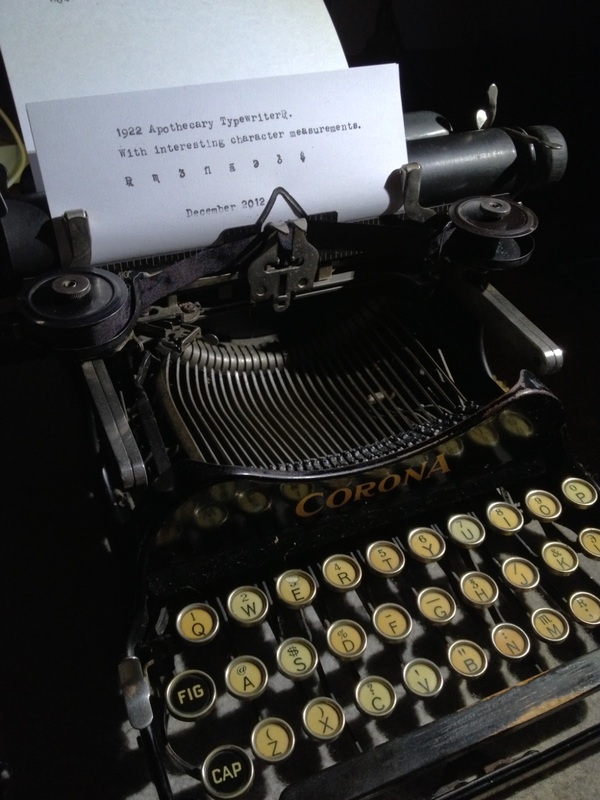 A seller was offering up a typewriter that had the requisite ‘Pharma’ (as a lot of forum members had called them) keys. But it was a mess. The machine looked as though it had been corroded to all buggery, and would probably prove to be quite a test to any would be restorer. The seller hadn’t actually noticed the unusual characters on the keys, and as such didn’t even mention them, or even photograph them closely for the sake of the sale. But he did make a bit of a noise about ‘working briefly for Smith-Corona once’. Not that this is a problem to me. I often look for basket cases that will challenge me to learn new skills. But it was also only for sale to people inside the United states, which kind of presented a problem to me, as I was on the wrong side of the Pacific Ocean. I quickly crunched the numbers and made some calls, and I managed to tee-up a few people who would could re-post this machine to me. But I shouldn’t have worried, as some polite emailing and negotiation seems to go a long away on ebay sometimes, and I managed to convince the seller to post to Australia. The auction ended without anyone else bidding against me. Either no one else noticed the unusual keys, or the condition of the machine was a real turn-off. Within a week I had on my desk a very crusty and rusty old Corona 3. Upon opening the package my heart sank. 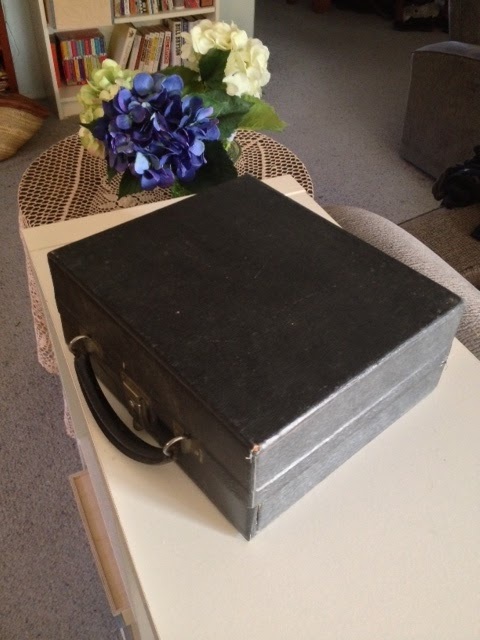 The typewriter case was damaged, and the machine was floating around inside the packing box. But the machine was complete, even if it looked like it had sat at the bottom of a swamp. I sat it next to my other Corona 3 – a machine that I had bought off Joseph over at the ‘Typed on paper’ blog, and from an aesthetic point of view Joseph’s machine highlighted how poor a condition this machine was in. Even mechanically this machine had some real challenges. Which, I’m glad to say I was able to overcome. Not so shabby eh? Still a little more work to go, but it’s typing happily, and looking pretty damn fine. But cleaning and fixing this machine was one thing. The hours I spent sorting this machine out was equaled by the amount of time I spent finding pretty much nothing in relation to these ‘Pharma’ typewriters. So let’s call it what it is: an Apothecary typewriter. I can understand why it is often referred to as a ‘Pharmaceutical typewriter’, but this is neither accurate, or doing justice to the cultural significance of these machines. I’ve come across examples produced by Royal, Oliver and Corona so far. But I wouldn’t be surprised if there were others to be found. You might be wondering “What is an Apothecary”? Well – let me indulge this question. In the modern era various proponents of ‘Alternative’ or ‘traditional’ medicine practitioners often are critical of how western culture has become reliant on conventional medicine. As such practitioners of these things often market themselves with traditional medicines that are ‘hidden secrets’ of other exotic cultures. But it isn’t true. Western culture has an extensive history of traditional medicine, and this medical tradition was endorsed, marketed and sold by people known as Apothecaries. Apothecaries, like modern pharmacists, had a language all of their own. They also had systems of measure that were mostly specific to their trade. Many of these symbols and measurements were carried through as a lot of apothecaries changed over to pharmacists. As we turned from the 19th to the 20th century, the role of apothecaries in our community changed rapidly. The scientific method had proven that many of the remedies and cures sold were a sham. And at the same time more rigorous research methods began offering far more effective drugs. As society began to embrace this change, many apothecaries changed along with it and become pharmacists. As such a lot of apothecary tradition came along with them. This wasn’t exactly an unusual thing for apothecaries to do. Whereas these days we see the word ‘apothecary’ as an old world term, apothecaries actually used a combination of tradition and cutting edge technology to market themselves. Around the world there’s still some shops that call themselves apothecaries, but they are more of a novelty shop trying to capture the traditional feel, while eschewing much of the technology. Apothecaries used complicated and advanced glass products to both sell their wares (Google: apothecary jar) and produce them. They made far more sophisticated packaging than was commonplace at the time, and they used electricity at a time that it was still considered a novelty product. They produced sophisticated means of advertising and labeling their products, and were voracious users of printed material. Really it comes as no surprise that these people had typewriters produced for them specifically for their purposes. Just had to add “$” there. it felt kinda right in a snake-oil salesman kind of way. As you can see there’s an interesting mix of more modern measurements that you may recognise, along with a couple of odd but familiar characters and some otherwise foreign ones. I’ve used some odd unicode below to give you an idea of what these symbols are, but unfortunately the unicode symbols haven’t always been exactly… 100% accurate. However they are close enough. This is an easily recognised symbol that is still in use today. But it has a long and complicated history. It is used to symbolise ‘take’ in latin – as in ‘recipe‘, Hence they ‘R’ of the symbol. However its origins go further back than that – as the crossed extension of the R is a nod to the roman god ‘Jupiter’ as a prayer to the patron of medicine. These days we often just refer to it as ‘prescription‘. The ‘Minim’ by comparison to many of these other symbols, is a much more modern addition. This much more of a pharmacological symbol than it is an apothecary, but it was originally specified for use alongside existing apothecary measurements. Its usage changed in modern context to define 1/480th of a fluid ounce. But it originally indicated 1/60th of of a fluidram. *note: this symbol should have a cross over at the bottom of the end, not an arrow as depicted here in the unicode. And speaking of drams and fluidrams, here’s the symbol for a ‘dram’. Fluid drams are indicated by putting an f, or an fl in front of this symbol. This as an apothecary measure takes its name from the ancient greet coin of the same name. A fluid dram is about the size of a traditional (but not the current size) teaspoon. While dry material dram is a little more complicated. Oh, and a variation of the dram is still in use with the production of Scotch Whiskey. Hot on the heels of the dram, we have the ‘ounce’. The symbol is very similar, but of course has that extra ‘z’ on top. Like the dram it is qualified as a liquid once with an f. Both drams and ounces are halved by adding ‘ss’ to the end. Other portions are indicated by fractions. Rounding out the list of major measurement symbols used by apothecaries, we have the ‘scruple’. This is a tiny measure that works out to about 1.3 grams. But is defined as ’20 grains’. The fl symbol has a much more recent addition to the system, and is probably a product of the apothecary transfer across to modern pharmacology. fl oz is a far more common symbol today, but previously fluid ounces would have been symbolized by an f3. The fl would have been used in combination with the previous symbols, along with an ‘a’ fraction key, to denote quantities in fluids. All of these units of measure were very complicated, and needed a considerable level of knowledge for the user to be able to interpret. I’ll note that ‘apothecary’ wasn’t just a term for people who sold the remedies, but was an encompassing term for the people that sold and distributed materials involved with the product as well as administering it. As such, doctors and nurses are also apothecaries. Once upon a time most of these people would have had to have been trained in the interpretation of these symbols. But today these are antiquated and clumsy units of measure that are actually more of a danger to use in a modern context. But pharmacists do still largely acknowledge the history and tradition of the apothecaries – even if our own world has mostly progressed past the days of selling snake oil alongside Aspirin. 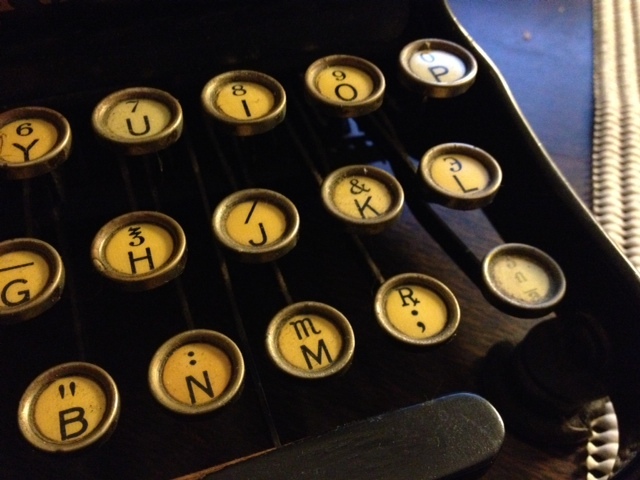 That is a great typewriter and a very informative post! I have the mathematical pendant. Very informative post indeed! Very interesting typewriter. Congratulations! Thank you for the very informative post. Truly inspiring post, Scott. I had no idea that these machines were relics of the era when apothecaries mixed their own elixirs and crushed their own compounds. I'm happy to have played a very small part in this voyage of discovery. You seem to have left out a description of one symbol, though: the a with a line over it. Is that the 'a fraction' key you mention? What does it mean? Thanks for your kind words about my writing. In addition to Shadow Cities, I've got a more recent book that just came out in paperback, called Stealth of Nations. I wrote the early drafts of both books on a 1930s Remington Noiseless 7. Very cool — I've seen these keyboards every so often but didn't know what most of the symbols meant. Thanks! There's a lot to be said for “antiquated and clumsy”. Much of their qualities being embodied in that Corona 3 you've brought back to life. Thanks for an entertaining and educative post, I never knew a scruple was a weight measure. I know… It is a great little machine, and I'm very happy with the result so far. Ha ha ha…. Maybe I should go down the 'breaking bad' road. It would certainly make for some interesting blog material. Thank you! 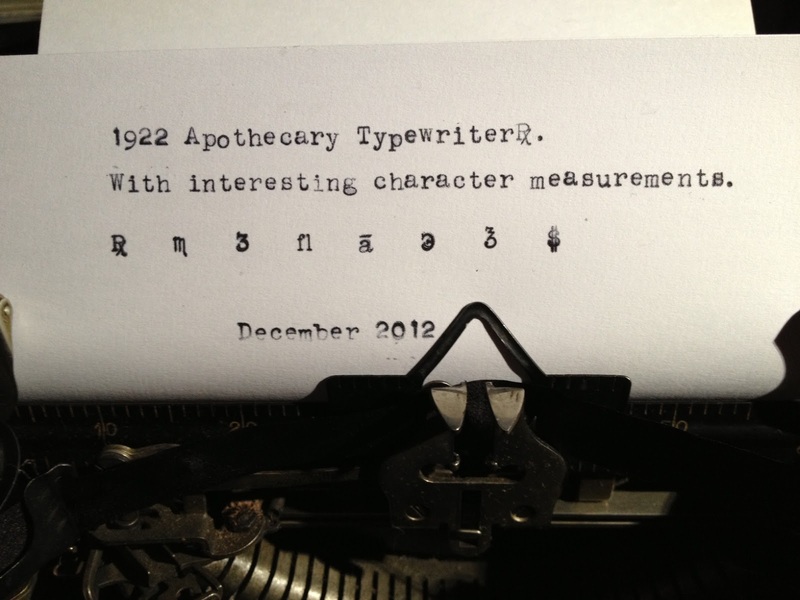 I didn't get too technical here… There's plenty out there on the Apothercary system, just not the typewriters. Gah! I did too… Thanks for noting the omission. I might do a blog in the future on how these machines were used, as the over strike a is more relevant to th e formula than it is a specific symbol. I also did notice your other book. And I'll probably take some time out in future to read it. But the book I mentioned here was of particular interest to me – which I'll explain later. Thanks Richard. I put in a bit of effort into this post mainly because I could find so little about these machines. So I knew when I wrote this, it was likely to be the only thing close to there being some reference material on them. I don't think these machines are rare, but there just isn't a lot about them around. Thank you! The Corona 3 is a really lovely machine. I don't see myself typing on it too often, but they are quite beautiful. Thanks for the great information! 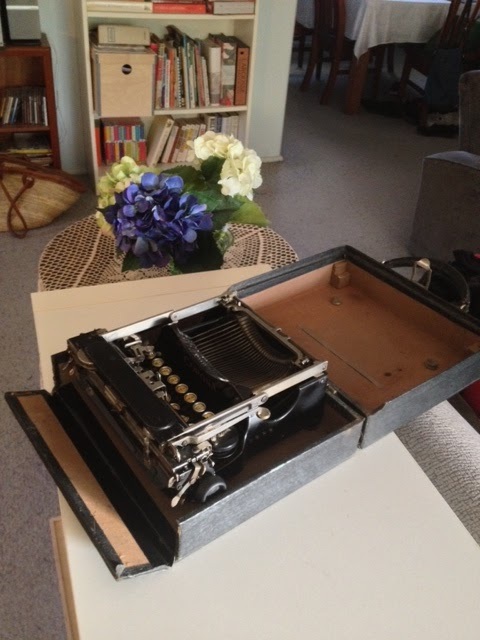 I just scored a 1930s Corona Silent flattop on ebay equipped with the apothecary keyboard. Your research is very helpful. Thanks Dwayne. Would love to see that machine! Sounds very interesting. I have a # 9 Remington with Apothecary keys. I'd love to see your Remington! Any chance I could coax a photo out of you?